This project was to demolish the existing outdated lab room and fit-out with new, state-of-the-art equipment. The existing lighting system, communications, power, mechanical system and plumbing system including emergency showers, eye wash stations, special gasses, and vacuum and air equipment were removed from the space. Design of new lighting, new electrical and communication layout was provided as well as new receptacles and teledata devices placed throughout the space and at the lab stations. Power was connected to normal and emergency electrical panels. The new fit-out also included fixtures and associated piping for the lab’s plumbing system. This consisted of new vacuum pumps feeding fume-hood connections, extension of the cold water, hot water, de-ionized water, air and gas systems to benches and fume-hood connections. Additionally, acid waste and acid vent piping was upgraded from glass piping to proxylene piping at all locations. 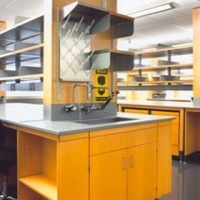 Lab space was provided with new emergency shower and eyewash stations, supplied with 80 degree tepid water at sinks to meet ANSI code requirements. Mechanically, new exhaust fans were placed on the roof and connections to all the hoods were extended and/or provided.